The Robert D. Farber University Archives and Special Collections Department at Brandeis is privileged to have in its holdings a substantial number of materials donated by Bern Dibner— industrialist, philanthropist, and one of the most famous American book collectors of the twentieth century. Born in a village near Kiev, in Ukraine, Dibner emigrated with his family to New York at the age of seven and settled in the Lower East Side. After attending the Hebrew Technical Institute, he matriculated at the Polytechnic Institute of Brooklyn, graduating as valedictorian in 1921 with a degree in electrical engineering. His work took him to Cuba, where he was placed in charge of unifying the country’s electrical system on a single grid. In the process, he developed an electrical connector to link the previously incompatible transmission lines of the various local Cuban systems, and with this invention he founded the Burndy Engineering company (an onomatopoetic play on his name, “Bern D.”), later known as the Burndy Corporation. This company went on to be a major success, eventually being listed on the New York Stock Exchange. After the success of his company, Dibner decided to retire from active management and pursue his intellectual and scholarly interests. As an inventor, he was fascinated by Leonardo da Vinci; Leonardo’s passion for technology as well as for the arts resonated with his own and catalyzed his interest in studying the history of science. In 1930 he traveled to Europe and enrolled in courses at the University of Zurich, where he studied history with a focus on Renaissance culture, science, art, and technology. 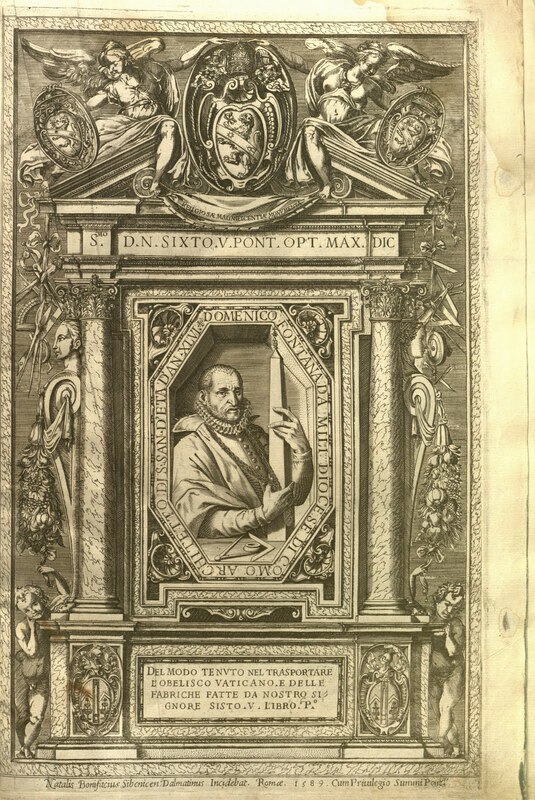 These studies in turn led to a fascination with rare books as the physical and intellectual record of human achievement and scientific and technological progress. Dibner began collecting materials and housing them in his office at the Burndy Corporation, but they soon overflowed into adjacent rooms and corridors. As the collection continued to expand, Dibner decided to found, in 1941, a dedicated library to house the materials, whose purpose would be “to acquire and maintain the books, manuscripts, laboratory records, photos, drawings, and reports that record the progress of science.”1 Over the following decades the Burndy Library grew to be the preeminent American collection of materials on the history of science and one of the greatest specialized libraries assembled in the twentieth century, housing tens of thousands of rare and obscure volumes, which were made available to scholars and historians, first in dedicated rooms in the Burndy Corporation’s new headquarters in Norwalk, Connecticut, and later in a separate library building, designed by Robert Rogus, which opened in Norwalk in 1964. Dibner’s interests extended beyond collecting, however, and the Burndy Library imprint may be found on thirty-seven scholarly publications, twenty-one of them authored by Dibner, addressing various themes and controversies in the history of science and often drawing heavily upon the materials held by the library. 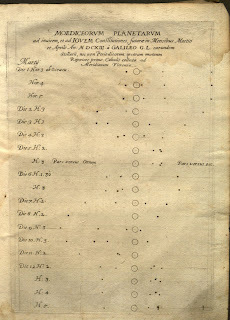 His most famous publication remains The Heralds of Science, a descriptive catalogue of two hundred “epochal books and pamphlets in the physical and biological sciences in the Burndy Library that were instrumental in establishing our age of science.”2 The careful scholarsh ip that went into annotating and justifying the choice of materials in this catalogue is illustrative of the depth of scientific and historical knowledge that underlay Dibner’s collecting, and this text is regularly cited when a book in the history of science is described as being of particular importance. In the following years, Dibner donated portions of his collections to various institutions, eventually dissolving the Burndy Library, with a large number going to the Smithsonian, where a wing is named for him, while another sizable collection is now housed at the Huntington Library in California. He also supported the library at his alma mater, the Polytechnic Institute of Brooklyn, which was renamed in his honor, and endowed the curator’s position at the Albert Einstein Archives at the Hebrew University. 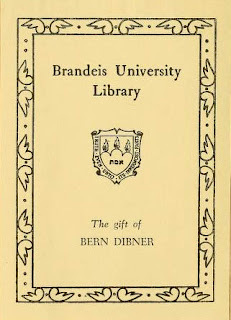 Dibner’s association with Brandeis began very early in the university’s history, and he was influential in the development of special collections resources for the university library. 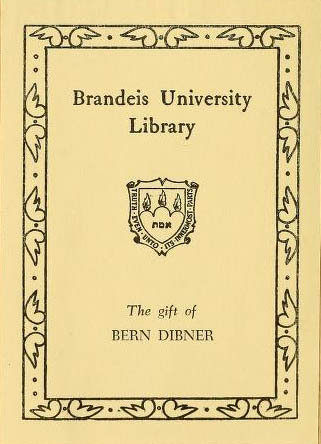 As a member of the “Br andeis Bibliophiles,” a group of prominent book collectors devoted to supporting the fledgling Brandeis library system and contributing to the advancement of learning by acquiring and donating relevant and important materials to the library’s holdings, Dibner contributed several major collections to Brandeis. These include the “Da Vinci Collection” of both modern and rare materials related to the work and study of Leonardo da Vinci, the “Rockwell Kent Collection of Prints,” and, perhaps most important, the “Bern Dibner Collection in the History of Science,” which has benefited from a recent full cataloging review that makes these materials more readily available to the university community and beyond. 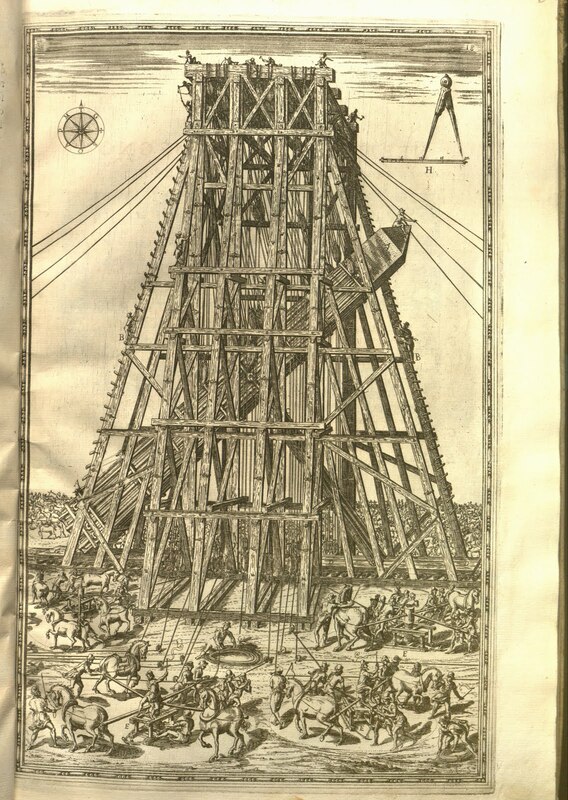 This collection is comprised of nearly 150 extremely rare and valuable texts in the history of science, which chronicle many of the major scientific discoveries from the fifteenth century to the twentieth century. 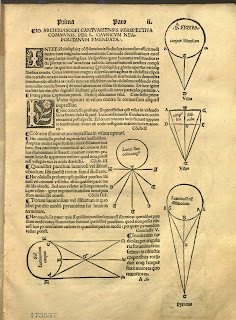 The collection includes several incunables, or texts printed before 1501, in the earliest years of printing, through first editions of the publications of Albert Einstein and other twentieth-century luminaries. Together they provide a remarkable record of scientific progress and human achievement and chart one tangent of the course of Western history over the past 500 years. The earlier texts are generally finely printed and lavishly illustrated, often housed in their original bindings, and quite a few of these materials could not be found on the market today for any price. 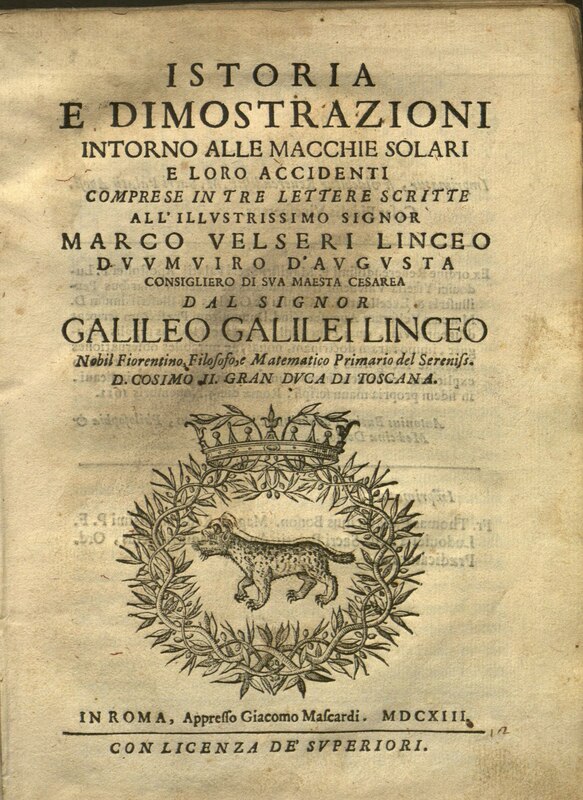 Among these rare texts are three extraordinary early editions of works of Galileo, the first editions of Galileo’s treatise on sunspots from 1613 and of his writings on the laws of motion from 1638, and the third edition of his work on the ge ometric compass, published in 1649. The earliest of these volumes is particularly interesting. 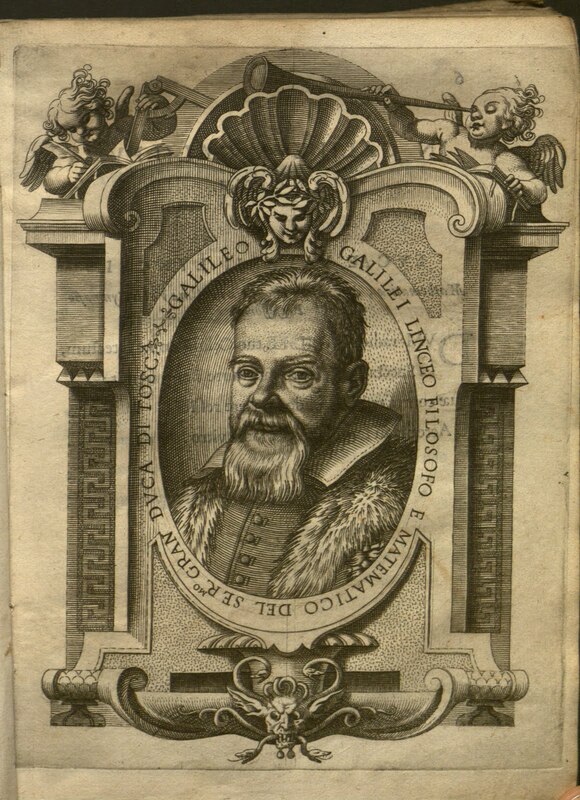 Published in Rome in 1613, the Istoria e dimostrazioni intorno alle macchie solarie loro accidenti [Rare Dibner QB525 .G2 1613] chronicles Galileo’s discovery of and observations about sunspots and includes 44 beautiful full-page engravings and a fine portrait of Galileo by Villamena. 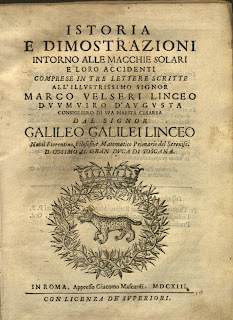 This volume is lacking the 55 page supplementary section added to some copies of the first edition, but scholars have argued that the supplement was actually not issued immediately upon publication, thus almost certainly marking this as the first issue of the first edition of one of Galileo’s earliest works. 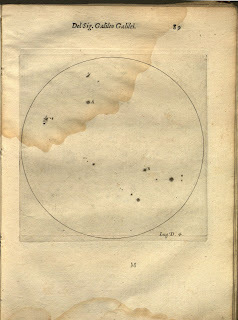 These three volumes by one of the most prominent scientists in western history are illustrative of the importance and rarity of the materials in the Dibner Collection, many of which are central to any detailed study in the history of science. 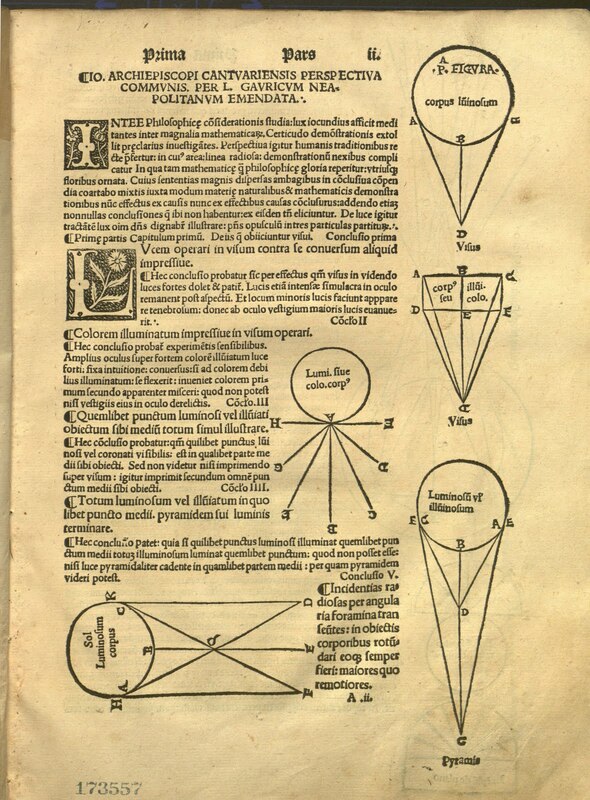 The collection includes a great number of important but lesser-known works as well, such as the Perspectiva Communis [Rare Dibner + QC353 .P413 1510], a treatise on the developing science of optics by John Peckham, archbishop of Canterbury at the end of the thirteenth century (d. 1292). This edition was printed in 1510, and thus may be described as a “post-incunable,” since, though it was issued after the ending date of the incunabula period in 1501, it retains many of the features of early printing. 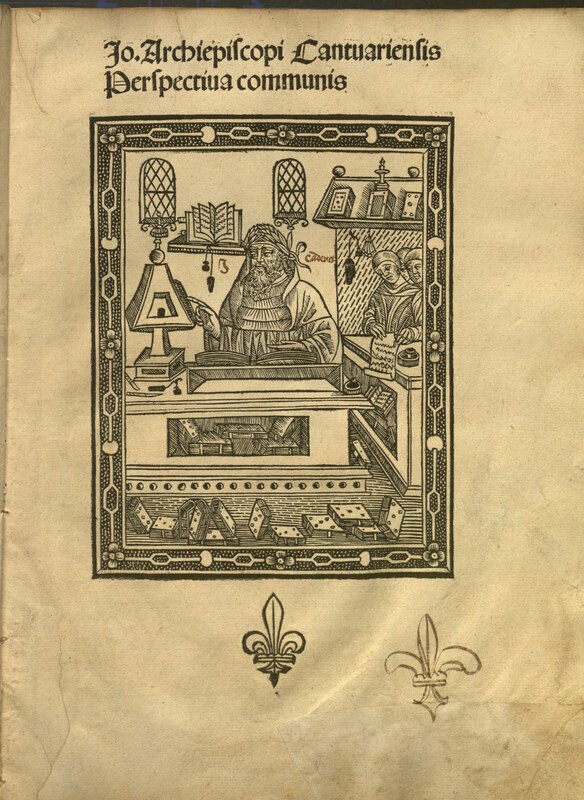 In this text, these features include beautiful marginal woodcuts illustrating the scientific observations described in the text, as well as a fine full-page title illustration of John Cantuarensis at his desk studying a scientific instrument as he dictates his discoveries to several scribes. The text is housed in its original binding of thin paper boards covered by an earlier incunable leaf. 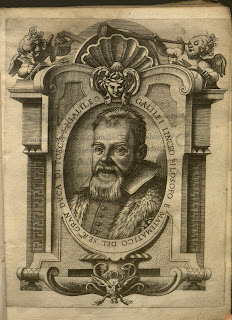 On the verso of the final leaf of the text (f. 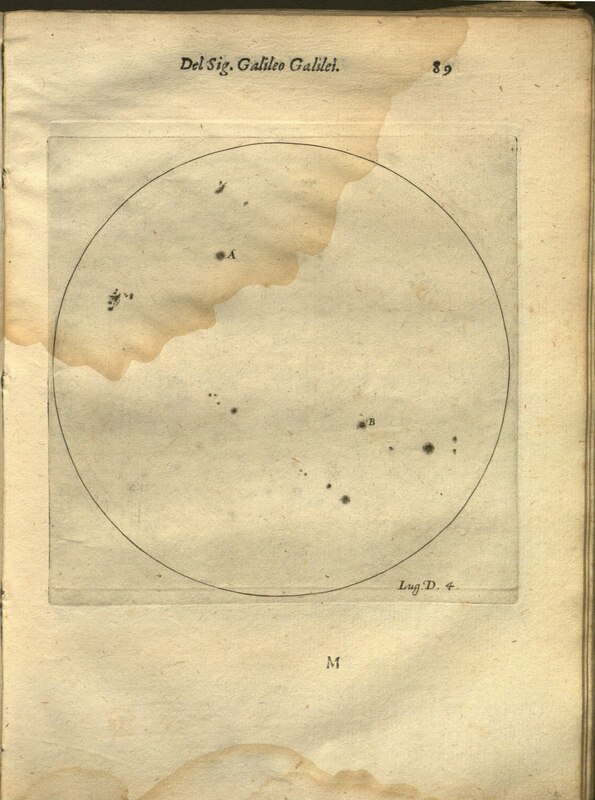 18v.) 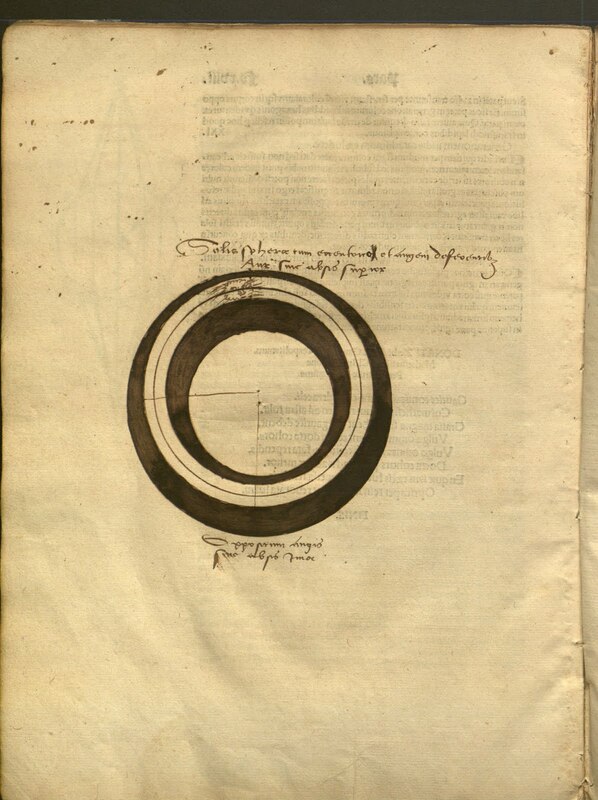 is a manuscript astronomical diagram, likely also from the early 16th century, whose regularity suggests it was almost certainly drawn using a compass, likely by a student of optics studying this work. 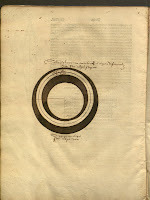 It is only reasonable that a discussion of the Dibner Collection should move from an important text on optics to conclude with perhaps the most visually striking text in these holdings, a book with the descriptive title Della trasportatione dell’obelisco vaticano et delle fabriche di Nostro Signore papa Sisto V [Rare Dibner ++ DT62.O2 F6 1590]. 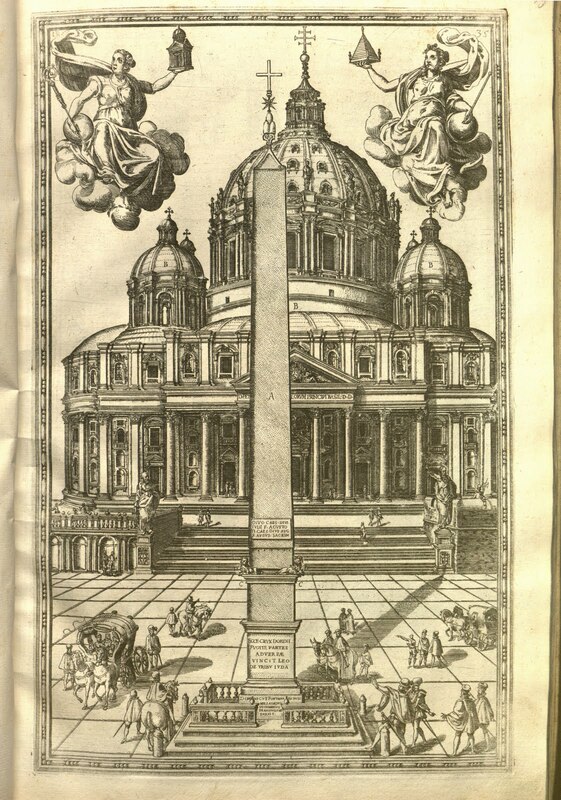 Published in 1590, this book describes one of the greatest engineering feats of the Ren aissance, the moving of an obelisk to St. Peter’s Square and its erection before the basilica of St. Peter in the Vatican. 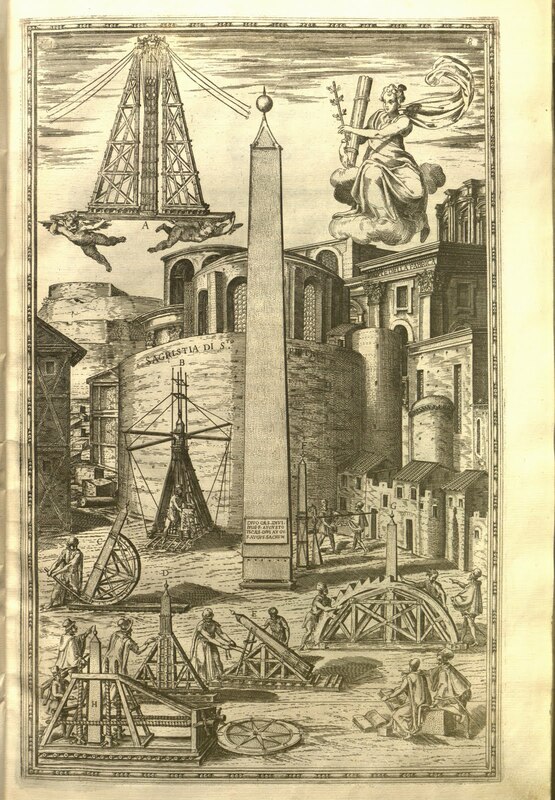 A huge folio, the volume includes dozens of full-page plates depicting the engineering processes involved in moving the obelisk as well as an extraordinary full engraved title page and architectural engravings of several buildings in the Vatican. 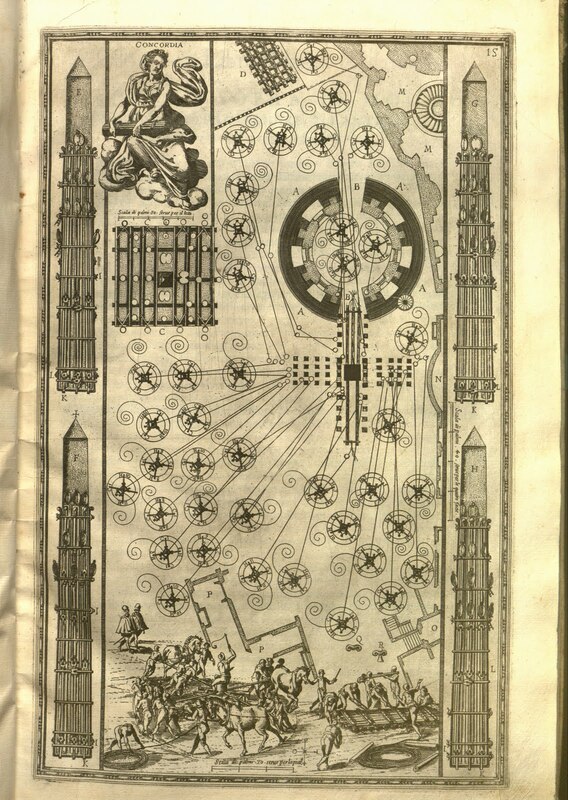 The stunning detail of these drawings invites careful perusal, and may interest students of the arts as well as students of engineering, particularly as many of these images combine detailed scientific depictions with allegorical and mythical figures such as “Concordia” and “Firmitas” who preside over the engineers’ labor. 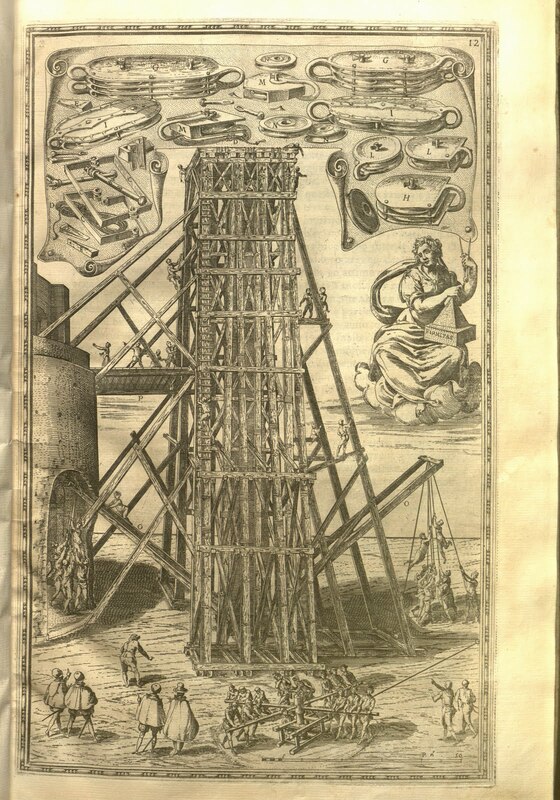 Though the book is designated as “volume one,” it is in fact the only volume printed, and thus this text is a complete first edition of a fascinating testament to the engineering and publishing accomplishments of the Italian Renaissance. The volume is bound in beautiful full blind-stamped alum-tawed pigskin, probably the most durable binding material of the sixteenth century, which has preserved the volume in remarkably pristine condition over the course of its life, which now exceeds four centuries. 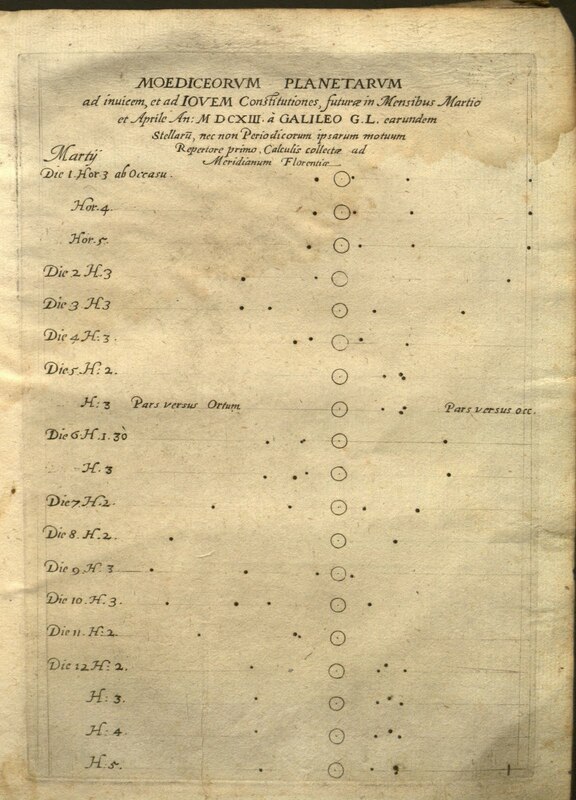 Taken in its entirety, the Bern Dibner Collection in the History of Science is a remarkable record of human achievement over the past five centuries and an extraordinary resource for students and scholars at Brandeis University. 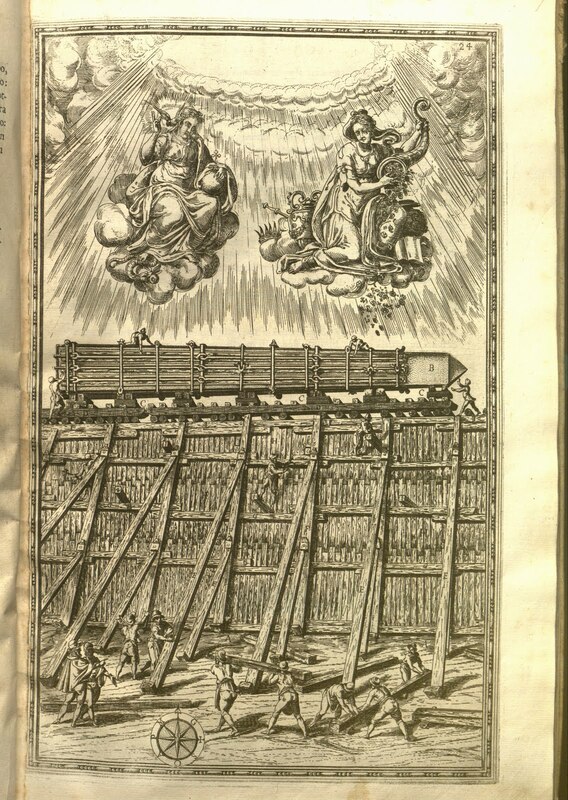 The entire collection may be accessed through the OneSearch library catalog; selected volumes may be viewed online via the Internet Archive, and all are available in the reading room of the Robert D. Farber University Archives and Special Collections Department. 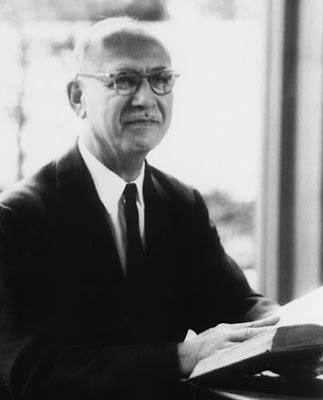 Mr. Dibner also funded a professorship at Brandeis along with the collection: it was held by a number of the most prominent and distinguished names in the field, including Frank Manuel, Lorraine Daston and Steven Harris: the presence of these scholars on the faculty of course meant that our holdings include a good deal of supporting material. Unfortunately, how and why I do not know, that bequest was recently altered so that it no longer supports a historian of science. This welcome re-cataloging and spotlight are thus, alas, ironically late. I came to Brandeis drawn in part by then-Dibner Professor Lorraine Daston and have reasons of my own, though a literary historian, to use the material, so I'm happy to find it more accessible, despite the sad loss of the Dibner professorship. It is especially welcome in that Mr. Dibner's other local gift of major resources, the Burndy Library and Dibner Institute at MIT, to which we had access, has been moved to the Huntington Library in faraway Pasadena, CA. Interested graduate students in the early modern period can find very good holdings at Harvard's Houghton Library, but unfortunately access to supporting materials in Widener and Cabot costs $750 per year.